So I read all your packing pages... Your tips work! Thanks." Glad we could help. 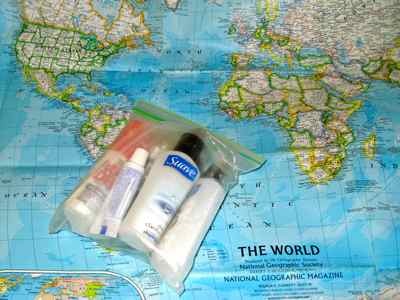 We first wrote about packing for getting easily through airport security checkpoints years ago. Unfortunately, most all of those tips still apply. Security has NOT eased through the years. In fact, much to our consternation, many items that we used to insist should only be packed in your carry-on luggage will now have to be checked on certain international flights into the U.S.A. The Department of Homeland Security says no electronics larger than a cell phone on selected flights. This won't affect you on domestic flights yet... and it won't affect most of you on international flights for that matter, but we're off on a trip where it will affect us, so we thought we'd better add this rule to our travel security alert packing guide. We'll pack our camera on the flight home, but you can be sure we'll take out that little memory card and carry it with us! ....but travelers should stay informed of developments and be prepared when they get to the airport. I've mentioned before that Mark worked for an airline, so he dealt with some of these security issues every day. Stories about travelers not packing correctly... people saying, "I didn't know I couldn't take that," or "Nobody told me." and it must be zipped closed. ...but then you must pack them in a bag that will be CHECKED... not carried on the plane. 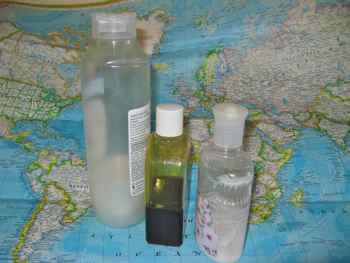 The BOTTLES you pack must be 3.4 ounce size (100 ml) or less. The bottle is too big. Details all about those one liter/quart bags and what is allowed. Read through those pages for details. But let's briefly go over what sizes are allowed and how to carry them for fewer hassles when you travel. ...or that great wine you thought you could take home. Check your Liquids or Not? When all of these security limits were started, the TSA limited us to 3 ounces. Through the years this has been standardized to coordinate with metric measurements, so you are now allowed 3.4 ounces or 100 ml. Even in the U.S. many cosmetics are 100 ml, so that makes it a little easier. And remember, you can't take two plastic bags. It's one per person. At the security checkpoint, you will have to take your plastic bag out of your carry-on and place it in a bin or on the conveyor belt for separate x-ray. These adjusted regulations are probably what we're going to have to live with for the foreseeable future, so for larger sizes of your shampoo, toothpaste and lotions, the choices are to pack them in checked in luggage, or go shopping on arrival. See our security alert cosmetics packing guide for tips for you ladies. And take a look at the other pages I listed above for more details about how we pack to adhere to the rules. You canNOT take a filled water bottle through security. Empty bottles can go through. Beverages and other items purchased in the secure boarding area may now be carried onboard the aircraft. Exceptions are still made for slightly larger quantities of essential medications and prescriptions. When packing medications in carry-ons you are not limited to the 3.4 oz. / 100 ml rule. If your medically necessary items exceed 3.4 ounces, or if you carry them outside of the one-quart, zip-top bag, you must declare them to the TSA at the security checkpoint. It bears repeating that each airline and airport may impose its own rules. Government agencies and the airline industry are always working on adopting uniform standards, but still, they may vary from country to country. Rules for what is carry-on size are more stringent outside of the US. So in addition to following the security rules, make sure you keep your most essential items in bags that are light enough and small enough to be allowed on those international flights. You may find that you have to go through a secondary security screening for flights into the U.S. Don't fight it... it's all just part of traveling these days. You may shop at duty free stores and take your purchases on the plane, but keep in mind, if you have to change planes... especially in the USA, you may have to go through another security check and those items can't go. Security alerts can be put in place immediately when a serious threat is discovered. The restrictions on what you can take in your carry-on luggage onto the plane may be loosen or tightened as any given threat is evaluated. This could even happen when you're in the middle of your trip. We can tell you all about that. We know.... we've done it... right after 9/11/2001 coming home from Africa! 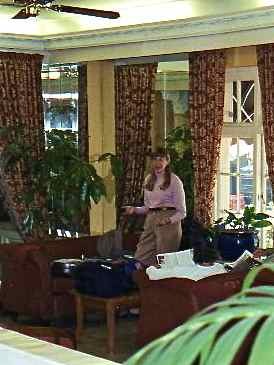 When we came home from Africa in late September 2001, we were only allowed to carry on a wallet, passports, tickets, prescription medications needed for the flight, and eyeglasses. It was a tense time. Our travel security alert packing guide is a starting point, but it is by no means the definitive answer to "Can I take it or not?" Each airport and airline may impose its own rules. These rules can be confusing. You'll probably find that even individual agents or officers may interpret the rules differently. If you're still not sure you can try to contact your air carrier and/or the airport you are flying from to see what they say. For the latest information, a good place to check is with the Transportation Security Administration or your government security site. They have lists of permitted and prohibited items and information on what to expect at screening. If carry-ons are banned again in the future, valuables become more of a problem. Our travel security alert packing guide is a work in progress... It has to be with the rules changing from time to time. Laptops, cell phones and cameras are allowed and SHOULD go in your carry-on luggage, but if that changes, plan ahead... Which electronics do you really need? If you take them, can you lock them to the inside of your luggage with a security cable? We've always traveled with a camera, and more recently with our iPad or laptop, but remember if you end up having to check your luggage anything in an unlocked, checked bag could be at risk. Plan ahead. Use our travel security alert packing guide to plan how you will pack. Do you need to buy new locks for a checked bag? If you're on business, can you e-mail computer files ahead? Can you pack a thumb drive instead of your laptop? Which electronics do you really need? Get to the airport EARLY. I'm going to repeat that. An absolutely essential travel security alert packing guide rule is GET TO THE AIRPORT EARLY. You may have driven your boarding passes at home, but you have to allow for the possibility of long security lines. Mark is always telling me about people who get to the airport 28 minutes to flight time saying, "I can make it." Be patient at security. You will almost certainly be required to take off your shoes, and your jacket, and empty your pockets, and take off watches. It's going to take longer than you think it should. None of us like it, but we have to live with it. Take your time. When you're regrouping after security, don't be in a rush because it took so long.... check to make sure you picked up all of your belongings. We're no happier about this than anyone else it. Even with carry-on restrictions, we will continue to pack light, but where and what we pack with change as the situation does. So I've tried to come up with a travel security alert packing guide for our own use, and you may find some helpful suggestions for your trip.... because you're still going to take that trip... right? !